Great news for everyone waiting for the release of YouTrack 4.0, especially with Agile support that we’re anxious to bring you! Finally, the latest 4.0 Release Candidate is gone to JetBrains issue tracker production and available for internal and external users! Download the latest YouTrack 4.0 RC or play with a sample InCloud instance now. What does YouTrack 4.0 bring? 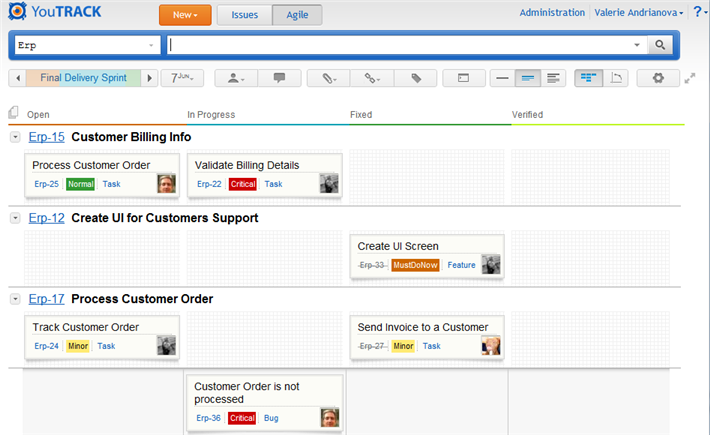 Now Scrum teams can plan, visualize and manage their work during a series of consecutive sprints, while teams that follow a Kanban process can manage and measure their work flow on the board. Manage your backlogs, create a number of sprints, group your tasks in swimlanes, move your tasks around the board, track progress on the Burndown chart, use the Cumulative Flow chart to detect bottlenecks, and much more! For more details, check the YouTrack 4.0 RC release notes. To download the latest RC (#3655) or play with our sandbox InCloud instance, please visit our EAP page. Also, you are welcome to check the biggest YouTrack Installation (around 400,000 issues and 30,000 users) on JetBrains issue tracker production. It’s open for guest users and new user registrations. Since we have moved our own tracker to YouTrack 4.0, it means that public release is really close. Stay tuned to our news! Be Agile with YouTrack and keep tracking with pleasure! This entry was posted in release and tagged Agile, Kanban, RC, Scrum, update. Bookmark the permalink. When Youtrack goes public will existing YouTrack-Cloud users be switched over automatically?